Get your inventory back after death. This mod places a tombestone at the location where you died automatically. This tombestone has an inventory and can only be accessed and destroyed by the owner or tribe, but it does not have any collision. When you die, your inventory is transferred to the tombstones inventory. When you respawn you get your items back from the tombstones inventory. You can disable this feature (see below). In the case that the game is unable to spawn the tombstone, the death corpse will be accessible as in the standard game play. This mod is useful for all players who have difficulties to get there items back from the death corpse. To customize the behaviour of the tombstone you can enter the following ini entries (all entries are optional). Put more than one entry under one [TheTombstone] paragraph. Respawning after players death, the inventory of the players tombstone is transferred to the player. If True, the tombstone is destroyed if the inventory of the tombstone is emptied. It will not be destroyed if the player carried nothing. setting this option to a value higher than 0 will auto destroy the gravestone after [value] seconds. the default setting disables "auto destroy after seconds". You want your own ARK Survival Evolved game server? Use the links below to save 5% of the original price! 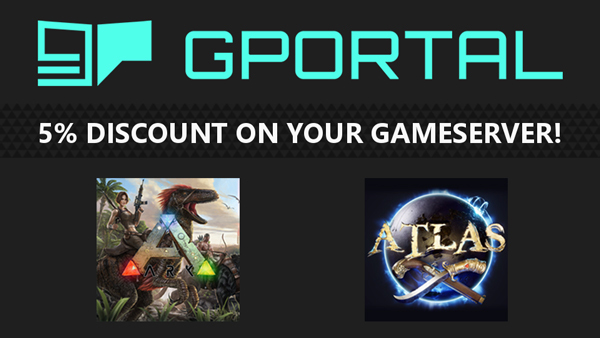 [www.g-portal.com]If you like my mods, please thumb up and share the link with your friends. @rap did you enter this? @rap what value do you want? True or false? If I put this KeepInventoryOnDeath=True/False in gameusersettings.ini under server settings it doesn't work. Setzt es Grabsteine auch für schon passierte tode, wo das inventar noch da sein sollte ?